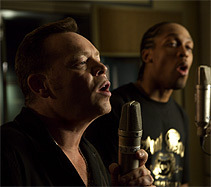 RUNNING FREE, ALI CAMPBELL'S second solo album, was released towards the end of 2007 and featured a mix of covers and originals along with a number of duets with guests that included Smokey Robinson, Mick Hucknall, Beverley Knight, Lemar, Bitty McLean and Katie Melua. The title track from the album  an enjoyable duet with Beverley Knight  is due to be released at the end of March (2008) and Beverley, speaking from the studio while recording with Ali, said: "To share your artistry with someone else who is on a very similar mindset to you is the most fantastic thing. I absolutely adore it. It's an honour to be here." It came as no surprise to hear that Running Free was to be a single CD release as there are so many things to like about it. As a stand-alone track it is full of promise to be a hit and the chemistry between Ali and Beverley is clear. The sound is classic Ali Campbell with contemporary lifts and jaunty chords of hip-wriggling delight. Ali's wonderfully-husky tones meld with Beverley's luscious vocals to create a winning formula. Along with a compelling urge to sing along, the dance-ability factor is thrown in for good measure. As the voice of the legendary Birmingham reggae band UB40, Ali has sold over 60 million records worldwide. Now performing as a solo artiste, he is looking forward to staying true to his love of reggae and its ongoing capacity for innovation. On April 3 Ali will be playing a one-off concert at London's Royal Albert Hall, where he will be joined by many of the artistes on the gold-certified Running Free album for a very special evening. In June he is to take to the road for his Running Free tour  his first full UK solo tour since his departure from the band he co-founded thirty years ago. The national tour will feature songs from Ali's two solo albums  Running Free and Big Love  alongside other reggae gems that Ali has always wanted to perform. And, of course, there will be the classic UB40 hits such as the notable Red, Red, Wine and Kingston Town. 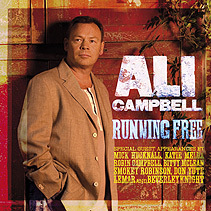  Running Free, sung by Ali Campbell and Beverley Knight, will see its UK single release on Crumbs The Label on 31 March (2008). ALI CAMPBELL'S BRILLIANCE continues to shine through yet again as Bitty McLean joins him centre stage on their creditable cover version of the single release Would I Lie To You  which was originally a Number One hit for Charles and Eddie in 1992 and was written by Dublin-based song-writing duo Leeson & Vale. As a duet, Ali and Bitty work incredibly well together, clearly in harmony with each other  and not just while singing. We were not surprised to learn that their relationship dates back to the early 90s when, fresh out of college, Bitty joined UB40's Dep International Studios as a tape op. Naturally, he soon progressed to full production duties and his own solo recording career. By the end of 1994, Bitty had notched up three top 10 singles to be proud of: It Keeps Rainin', Here I Stand and Dedicated To The One I Love  thus proving himself as a stand-alone talent. Although it was a much-admired latterday soul tune, the mood of the song comes across beautifully on Ali and Bitty's version  now with a lilting reggae beat that you simply can't get out of your head. Nor would you want to. Ali is the instantly-recognisable voice of UB40. Would I Lie To You is one of eight duets on his new solo album Running Free. Ali says: "I was determined that Bitty would be on the record; it was just a case of choosing the right song. Bitty is a production fanatic and one of the best singers ever to come out of Britain." Equally enthusiastic, Bitty adds: "Even though I have known Ali for years, this is my first chance to duet with him. It's great to finally get the chance to sing with Ali on this record and it is also exciting that this duet has been chosen as a single. I think the album Running Free is a classic!" We here at MotorBar agree  we reviewed the Running Free album when it was first released. It is a reggae-soul-pop tour de force featuring The World's Greatest Rhythm Section, Sly Dunbar and Robbie Shakespeare and duets with Smokey Robinson, reggae giants Aston "Family Man" Barrett and Ernest Ranglin, Mick Hucknall, Bitty McLean, Beverley Knight, Lemar and Katie Melua. Ali's brother and fellow UB40 band member Robin also joins him on The Everly Brothers' Devoted To You. Plans are currently underway for a duet concert next year at The Royal Albert Hall starring the various singers who appeared on the album. All the artistes have been filmed for a special Making Of documentary for television to be broadcast later this year. 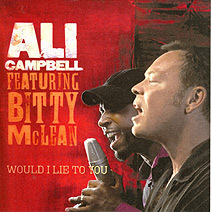  Ali Campbell & Bitty McLean's single Would I Lie To You will be released on November 26, from the album Running Free (out now) on Crumbs The Label distributed by Absolute/ Universal. JUDGING FROM THE ALBUM SAMPLER I've just heard, we've got another winner here. This is really, really good music with a great toe-tapping beat. I loved listening to it in the car and it had a feel-good factor about it. Road rage? Forget it! It made me drive with a smile. and doing it for himself. Ali's got some interesting collaborations with legendary singers and musicians who have just got to be on the same wavelength  it comes out like that! In the preview album DVD trailer, Ali enthuses: "I think it's going to be a big album because it's got so many good guests in it," but that's dumbing down Ali's own unique voice and songwriting talent. True, the album features The World's Greatest Rhythm Section, Sly Dunbar and Robbie Shakespeare and has some creditable cover versions, but the 'star' is Mr Red, Red Wine himself! is bound to dominate the air-waves on its release." A duet concert next year at The Royal Albert Hall will guest-star the various singers who appeared on the album  and they have all been filmed for a special 'Making Of' documentary to be broadcast on tele-vision later this year. UB40's best loved album was Labour of Love, on which  in their own inimitable style  Birmingham's finest covered songs by their music idols. Running Free is a natural successor and Ali trumps that by actually inviting his music idols to sing alongside him. Ali's decision to team up with soul icon Smokey Robinson and reggae giants Aston 'Family Man' Barrett and Ernest Ranglin has given him a great deal of pleasure. "They were a joy to work with," he says. "This is a classic party record with great people on it  and it's a bunch of great songs." Every single track on Running Free works for itself. You really do need to check out this collaboration with some of music's all-time greats and the equally talented relative newcomers from all areas of the contem-porary music scene  Mick Hucknall, Bitty McLean, Beverley Knight, Lemar and Katie Melua  to appreciate just how well it has come together. Recorded at Jamaica's Anchor Studio and Eden in West London, Running Free is a harmonious delight. Just try keeping still as you listen to Ali's version of Johnny Nash's 1968 Top 5 hit, Hold Me Tight  fresh from wowing audiences across Europe. Even your pulse will throb along to the beat, seemingly with a will of its own! A cover of the Al Green song, I'll be Standing By, features guest vocals from Lemar. "It is," says The Publicity Machine, "another superb example of lilting Lovers Rock, the contrast between the sweet vocals and tuff beats, plus the solid rhythms and crystalline production, making this one of many contenders for single release on Running Free." Quite. The title track is a duet with UK soul diva Beverley Knight. A faster-paced original composition, the male/female vocals work as perfectly together. Cold Around My Heart is an original tune with a sweeping, elegant melody and Don't Try This At Home  another original song, this time with Katie Melua  is just begging to be lifted from the album for a single release, with its infectious rhythm and delightful chord sequence. Bitty McLean, a former tape op at UB40's Dep International Studios, helps turn the already much-praised Charles & Eddie soul title, Would I Lie to You, into a beautiful slice of lilting reggae. Hallelujah Time, the Bob Marley song, is no less than a Motown summit meeting, featuring as it does vocal contributions from Smokey Robinson and awaiting a vocal addition from Stevie Wonder. A version of the Drifters' song that Ali has always wanted to cover, Don't Go, features Ali solo. This one is a gem and another great party tune. Yet another original composition, I Want One of Those shows Ali soar-ing gracefully over the melody and a version of Smokey's 1981 Number One smash, Being With You, features Mick Hucknall. Aston 'Family Man' Barrett, Ernest Ranglin and Don Yute bravely tackle Stevie's vintage Village Ghetto Land, with 'extra toasting' from the studio engineers kids. With a touch of genius, Ali's brother Robin joins him for a poignant rendition of the Campbell boys' childhood favourite, Devoted To You (the Everly Brothers). Ali Campbell, talking of recording Running Free and the freedom he enjoyed: "There was no compromise. I was in control. I was as happy as a pig in s**t, working with my heroes. In fact, I haven't been this excited about a record since Labour of Love." Great FUN. I look forward to the next one  if it's anything like this masterstroke you'll be singing it in your sleep.  Ali Campbell's single Hold Me Tight was released on September 24.  The Running Free album was released on October 1 on the label Crumbs, distributed by Absolute/ Universal.